Sergio came to Puerto Vallarta since he was young. He and his family arrived when he was two years old, so he considers himself a Local Native of Puerto Vallarta. His education was mostly achieved here at local schools, where after finishing high school, he decided to work for an airline. He found a job at Aeromexico Airlines where he worked there for almost 14 years as ticket counter agent and then he was promoted to supervisor and later promoted again as Station Manager. In 2001, after the airline, he ventured into the Real Estate business, were he was the personal assistant to the Broker of Feria & associates R.E. in Covina, CA., and he had the opportunity to learn and get the experience to work on the handling of escrow transactions, requesting inspections, showing properties, updating MLS Listings, Coordinating Open Houses and so on. 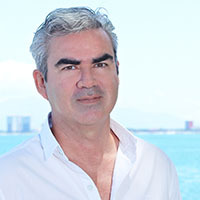 After a few years, he returned to Puerto Vallarta in 2008 and ever since he has been an active member of AMPI Nacional, and AMPI Puerto Vallarta, helping friends and clients to sell their property or find the property that they are looking for. He continues his professional formation and he´s currently in the last trimester of studies to become a Real Estate Lawyer at the University Arkos here in Puerto Vallarta in order to offer to his clients and friends all the legal advice and all the necessary information of the legal process involved when buying and selling a property in Mexico. He speaks fluently Spanish and English.